Kredits was established in 1998 by Don Eggert and Nancy Schmaus who started a pioneering microcredit program in Kazakhstan in 1997. Under their guidance, Kredits has grown into a premier provider of management information technologies to microfinance institutions worldwide. Philippines MFI Partner upgrades technology from spreadsheets to Kredits and benefits from business process optimization services. Kosovo MFI Partner upgrades Kredits and centralizes their data at 34 branches across the country to deliver real-time data consolidation and reporting. Brazilian MFI partner commences business operations using Kredits. Bosnian MFI partner implements "log-shipping" to improve data and risk management for branches without connectivity. Indian MFI partner commences "log-shipping" to increase HQ control, oversight, and transparency across branch network. Kredits delivers technology solutions for integrating financial account requirements. Kredits successfully delivers mobile technology solutions in China for secure, real-time management of client and financial data. Bosnian MFI partner successfully implements credit scoring technology to improve client risk management. MFI partners in Afghanistan, Kenya and Honduras commence operations using Kredits. 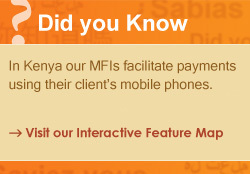 Kredits develops mobile banking solutions. Kredits successfully implements online centralized database management technology. Kredits successfully implements credit scoring and client drop-out analysis solutions. MFI partners in China, Albania, Guatemala and Cambodia commence operations using Kredits. MFI partners in Ivory Coast, Philippines, El Salvador and India commence operations using Kredits. Kredits implements comprehensive regulatory reporting solutions for multiple regulatory environments. MFI partners in Jamaica, Indonesia, and Madagascar commence operations using Kredits. Kredits delivers decision-making tools for client profile analysis and client risk management. Kredits develops technology solutions to support micro-insurance services. Kredits successfully implements poverty scoring solutions. Microsoft certifies Kredits as one of first technology solutions using SQL Server 2005. Kredits technology delivered using Microsoft SQL database. Kredits provides comprehensive support for Grameen-based microcredit models. MFI partners in Afghanistan, Albania, Namibia and South Africa commence operations using Kredits. Kredits delivers technology and business process engineering solutions for credit unions. Kredits becomes first microfinance technology solution provider in China. Kredits delivers comprehensive support for village banking. Kredits provides technology and business solutions for voluntary savings and deposit accounts. Kredits delivers comprehensive support for compulsory savings. MFI partners in Albania and Malawi commence operations using Kredits. Kredits delivers technology and business process engineering solutions for teller and cash payment functions. MFI partners in Afghanistan, Serbia, Uzbekistan, Sierra Leone and Mexico commence operations using Kredits. Kredits delivers technology and business solutions for servicing variable interest rates and loan repayment schedules. MFI partners in Kosovo, Azerbaijan, and Bosnia and Herzegovina commence operations using Kredits. MFI partners in Tajikistan and Kyrgyzstan commence operations using Kredits. Kredits implements comprehensive support for customizable client, financial, and risk exposure management reporting. Kredits implements customizable product and service development solutions for MFIs. MFI partner in Kosovo commences operations using Kredits. Kredits delivers comprehensive support for solidarity group microcredit model. Kredits delivers first multi-lingual technology. MFI partner in Montenegro commences operations using Kredits. Kredits delivers support for flexible loan schedules. Kredits implements technology and business solutions for accruals methodology. Kredits delivers comprehensive support for client attendance tracking. Kredits delivers data management and risk analysis support for guarantor tracking. Kredits becomes first microfinance technology solutions provider in Bosnia and Herzegovina. Kredits delivers support for invoice methodology. Kredits successfully implements first technology and business process engineering solution for MFI partner in Kazakhstan. Kredits develops comprehensive microfinance technology and business process solutions.